This article is about the TV crime series on ABC. For the singer, see Matt Houston (singer). Most episodes typically involved one of Matt Houston's close friends being murdered or involved in some criminal enterprise, requiring his assistance. C.J. had access to an Apple III computer named "Baby" that contained a remarkable database on virtually all living and deceased persons, allowing her to provide all necessary information. Series pilot: Matt Houston, an oil tycoon's son from Texas, comes to California to manage off-shore drilling. With plenty of cars, a helicopter, and lots of millionaire toys to choose from, Matt Houston finds plenty of time for his PI hobby. A disreputable tabloid's publisher is nearly killed after telling his four worst enemies he plans to run a front-page story on them. A famous fashion designer has been murdered and Matt's former girlfriend is under suspicion. A football player is being blackmailed by someone who says they have proof he killed the coach. When an actor dies after drinking from a tainted glass, the star who it belonged to becomes a suspect. A severed head in gelatin shocks a food critic who recognizes it as belonging to his partner. Sharks have been attacking beachgoers, and Matt wonders if something sinister might be going on. A critically ill Arab prince has been abducted. Matt tries to discover why a robot would murder the brother of its genius creator. During a party at Matt's, a research scientist is murdered. A champion boxer's physical ailments and his wife's addictions come into light after a murder. When a cat food mogul is found mauled to death by a domesticated tiger, his four ex-wives retain Matt's services so they can receive proceeds from the will. A yacht club is the target of a killer, concerning someone with ties to Matt. Five famous folks are summoned to Matt's place through a murderous ruse. A psychopath orchestrates attacks on Houston from his padded confinement. A famous scientist suffers a fatal heart attack while witnessing an alleged extraterrestrial visit by an Unidentified Flying Object. Someone is targeting C.J. and her sorority sisters. A gossip columnist is murdered after threatening to expose a high-class prostitution house. Matt's friend, who suffers from alcoholic binges and blackouts, is accused of murder. When a special code predicts deaths, Matt hunts for clues to prevent them and expose the code's reality. Matt is charged with murdering a jockey whose body he happened upon. A mystery is revealed when a murder-mystery writer is found dead at a convention. A notorious crime leader kidnaps C.J. in order to force a trade for his son who is being held in connection with a terrorism plot. While investigating a land scam, Matt finds out a few unnerving things about his family and his past. A former peace officer is jailed and under arrest for murder, but he might not have committed the crime. Matt is the victim of a stalker one-night-stand. Three stunning women have been murdered, their connection: they are all top centerfolds. After witnessing a brutal crime, a diabetic is deported to Mexico, and his mother is concerned about his condition. As he lay dying from a fatal gunshot, an associate asks Matt to protect Marilyn. Only one problem: Matt has no idea who she is. A man trying to expose dirty union tactics is murdered right after asking Matt to take the case. Did Chinese drug smugglers murder C.J. 's former roommate? In the attempt to protect her little sister from a child prostitute ring, a teenage call girl is murdered. A talented art forger is found murdered, and the clues may rest one of his paintings, which is now missing. A self-proclaimed "Psychic" who is involved in a kidnapping scheme targets Matt. A sniper assassin kills an innocent girl to maximize his targeting location. C.J. is left to deal with defending a man who has confessed to killing four teens. Someone thinks a renowned concert pianist is a mad strangler. While investigating the death of a nursing home nurse, Matt is shot. A retired Lieutenant Vincent Novelli is charged with stealing cocaine from a police evidence vault upon his return from vacation in Hawaii. A secretary is murdered after uncovering a plot to blackmail her boss. A serial killer who killed Matt's fiancee in the past reveals that he has struck again. A hospital angel of death targets Matt's father. C.J. is stalked by an obsessed admirer who murders her beau. A thief has second thoughts after stealing a cool $3 million from the mob. An amnesiac Matt wakes in his penthouse to discover a month is past and he is accused of murder. Buddy Ebsen stars as Roy Houston, Matt's uncle who investigates the accusations against his nephew and uncovers a mind control plot. Hoyt's young daughter is kidnapped by a child molester. A TV newsman covers a kidnapping that he might be involved in to boost ratings. Whether it's a religious cult or a commune, Matt must rescue a girl who is being bilked out of a $3 million inheritance by the evangelist leader who plans to murder her after he has gained control of the cash. After getting amnesia after a car accident, C.J. finds herself in prison and uncovers a prostitution ring. Guest starring Cynthia Cypert as Cynthia. Matt discovers that his cousin, who was once believed dead in Cambodia, is still a POW. The Cambodian warlord who has imprisoned Matt's cousin might be getting a little help from someone close to Matt. Two models have been murdered, and Matt can't accept the alibi of the most likely suspect. An international assassin has a grudge against Matt. Matt is dragged into a case involving international gem smuggling from a war-torn Vietnam. Guest-starring Scott Marlowe. The most dangerous game is revisited when a sporting goods mogul hunts athletes. An actress, whose infant son had been kidnapped a year earlier, asks Matt to investigate a woman she saw in a park with a child who resembled her lost baby. Matt believes that the man who abducted him as a boy is kidnapping again. Matt rushes to the aid of his cousin who is threatening suicide. A once-prosperous oil town is now home to corruption and embezzlement. Matt investigates blackmail murders with the assistance of one of the victim's sisters. A stewardess accidentally happens upon and photographs a murder and asks Matt to protect her. Roy fakes his death to uncover a plot to murder his CIA squad members. Matt's new flame has a family secret; her brother is funding Irish terrorists. Matt and company investigate a drug ring. Elizabeth, the object of Matt's affections, returns. 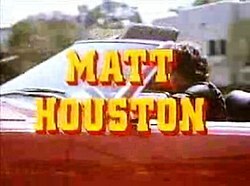 On May 4, 2015, it was announced that all three seasons of Matt Houston would be released the summer of 2015 by VEI, Inc. The release was pushed back and was later released on July 15, 2016. This page was last edited on 13 April 2019, at 05:43 (UTC).